One place to manage all of your social content from Facebook (profile & pages), Twitter, YouTube, Vimeo, Flickr, Delicious, Stumbleupon and Tumblr. 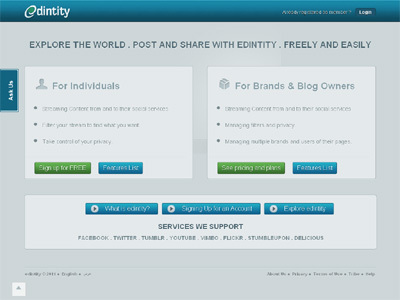 You can post from edintity back to these services, manage privacy and find stuff easily as you have all of your social content in one place. We broke down managing your social content into four parts: content flow, privacy, search and display. This focus approach and with an easy & simple to use user interface helps edintity to be unique in its offering. Also, we serve individuals and brands.